The Merovingian dynasty in Gaul or France was prominent in the 5th and 6th centuries, as the Roman Empire was losing its force and power. Several of the queens are remembered in history: as regents, as persuaders of their husbands and in other roles. Their husbands, many of whom did not limit themselves to just one wife at a time, were often at war with their own brothers and half-brothers. The Merovingians ruled until 751 when the Carolingians displaced them. For those whose lives are better documented (none of the stories comes to us as unambiguously objective history), I've linked to more detailed biographies. A major source for the history of these women is the History of the Franks by Gregory of Tours, a bishop who lived at the same time and interacted with some of the individuals listed here. Bede's Ecclesiastic History of the English People is another source for some of the history. Basina of Thuringia is reported to have left her first husband, and, in Gaul, to have herself proposed marriage to the Frankish king Childeric. She was the mother of Clovis I, giving him the name Chlodovech (Clovis is the Latin form of his name). Their daughter Audofleda married the Ostrogoth king, Theodoric the Great. Audofleda's daughter was Amalasuntha, who ruled as Queen of the Ostrogoths. Clotilde convinced her husband to convert to Roman Catholicism, aligning France with Rome. It was under Clovis I that the first version of Salic Law was written, listing crimes and the punishment for those crimes. The term "Salic Law" has later become shorthand for the legal rule that women may not inherit titles, offices and land. We know little about Ingund other than her family connections. We would know as little about Aregund as about her sister (above), except that in 1959, her sepulchre was discovered; some clothing and jewelry that was well preserved there served to identify her to the satisfaction of some scholars. Others dispute the identification, and believe the sepulchre of later date. A 2006 DNA test on a sample of the remains of the woman in the sepulchre, presumably Aregund, found no Middle Eastern heritage. This test was inspired by the theory made popular in The DaVinci Code and earlier in Holy Blood, Holy Grail, that the Merovingian royal family was descended from Jesus. However, Aregund married into the Merovingian royal family, so the results didn't really disprove the thesis. Taken as war booty, she was not Clothar's only wife (monogamy not yet being the standard among the Franks). She left her husband and founded a convent. Other wives or consorts of Clothar were Guntheuc (a widow of Clothar's brother Chlodomer), Chunsine and Waldrada (he may have repudiated her). Fredegund (below) had Audovera and one of Audovera's sons, Clovis, killed, in 580. 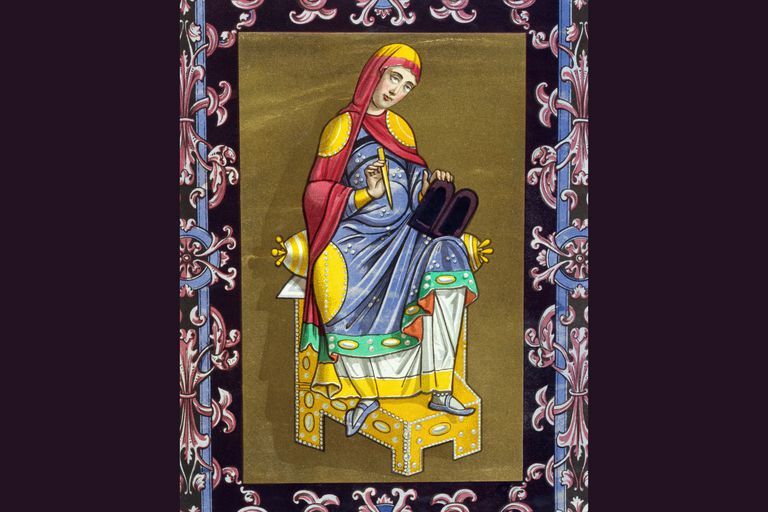 Audovera's daughter Basina (below) was sent to a convent in 580. Another son, Theudebert, died in 575 in a battle. Her son Merovech married Brunhilde (below), after Sigebert I died; he died in 578. Galswintha was Chilperic's second wife. Her sister was Brunhilde (below), married to Chilperic's half-brother Sigebert. Her death within a few years is usually attributed to her husband's mistress Fredegund (below). Fredegund was a servant who became Chilperic's mistress; her part in engineering the murder of his second wife Galswintha (see above) began a long war. She is considered, as well, responsible for the death of Chilperic's first wife, Audovera (see above), and her son by Chilperic, Clovis. Brunhilde's sister, Galswintha (above), was married to Sigebert's half-brother Chilperic. When Galswintha was murdered by Fredegund (above), Brunhilde urged her husband to wage war for revenge against Fredegunde and her family. Clotilde, who was a nun at the Convent of the Holy Cross founded by Radegund (above), was part of a rebellion. After that conflict was resolved, she did not return to the convent. She is credited with bringing Christianity to the Anglo-Saxons. Bertha, daughter of the king of Paris, was married to Aethelberht of Kent, an Anglo-Saxon king, probably before he became king in about 558. She was a Christian and he was not, and part of the marriage agreement was that she would be permitted her religion. She restored a church in Canterbury and it served as her private chapel. In 596 or 597, Pope Gregory I sent a monk, Augustine, to convert the English. He became known as Augustine of Canterbury, and Bertha’s support was likely important in Aethelberht’s support of Augustine’s mission. We know that Pope Gregory wrote to Bertha in 601. Aethelberht himself eventually converted, and was baptized by Augustine, thus becoming the first Anglo-Saxon king to convert to Christianity. Basina was sent to the Convent of the Holy Cross, founded by Radegund (above) after Basina survived an epidemic that killed two of ther brothers, and after Basina's stepmother had Basina's mother and surviving brother killed. She later took part in a rebellion at the convent.